Subject of the tests is an eCall Demo In Vehicle System (IVS) for the functionality check of the eCall Public Service Answering Points (PSAPs). The IVS may be used by manufacturers of PSAP systems as well by mobile network operators for the development and testing of own products and services for eCall. The IVS is configurable and can establish TS12 and TS11 as manual and automatic eCall. At a TS12 eCall an emergency call will be communicated to the mobile network with service flag manual or automatic eCall. After establishment of the connection the MSD will be transmitted and a voice channel opened to the PSAP. At a TS11 eCall, it establishes a voice connection to a configurable telephone number, transmits the Minimum Set of Data (MSD) and enables a voice channel to the PSAP. The data sent as well as the Meta data are recorded and are available for further evaluations. Additionally the timers of the HLAP protocol can be configured. The certification mark is awarded within the framework of voluntary certification based on defined test criteria derived from applicable eCall standards. Special emphasis is placed on the conformity to High Level Application Protocol (HLAP) and MSD (Minimum Set of Data). 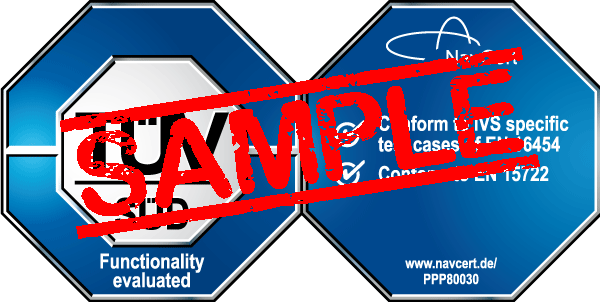 NavCert reviews the process for the continuous adjustment to new standards and for quality control of the software development in an audit. Conformity to EN 16454 is verified by means of application testing and audit. By the process of application testing it is validated that the IVS reacts correctly to the applicable test cases of EN 16454. Furthermore the correct coding of the MSD in accordance to EN 15722 is validated. Additionally in an audit, it will be checked, if the development and enhancement of the eCall Demo IVS underlie controlled procedures assuring that the quality of the IVS will be maintained for updated standards or functional improvements.